Though the samurai warriors of Japan have passed on to legend and folklore, their Bushido Code of Conduct continues to have an impact of Japanese society. It emphasizes eight virtues, utmost which are honor, discipline and morality. 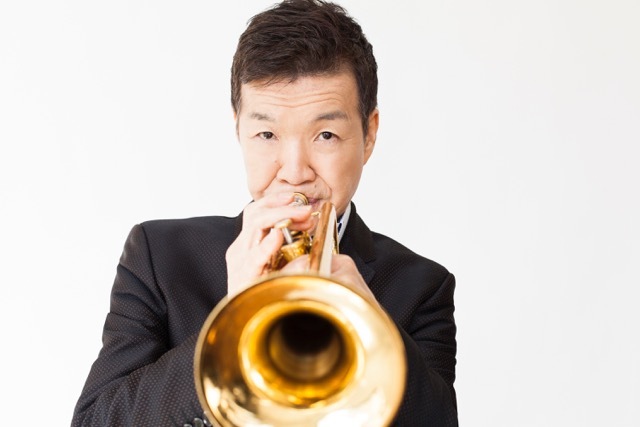 As a son of Japan, trumpeter Shunzo Ohno, has personally adhered to these guiding principles, and ReNew reveals a profound sense of purpose, accented by total mastery of his instrument in service to a higher calling. Dedicated to the ongoing recovery process since the 2011 tsunami in Japan, and to the resiliency of the people of Nepal, this recording presents Ohno in tune with the contemporary direction of jazz, while acknowledging his ancestral heritage. Having worked with bassist Buster Williams for over forty years, the opening track “Easy Does It,” is a funk vehicle which Williams sets up, allowing Ohno to take it into the pocket. The title song “ReNew,” floats with lush intonations, proposing a forgiving palette for meditation. This contemplative direction continues on “Alone, Not Alone,” an echo of solidarity with the tsunami victims portrayed as a somber ballad. Sensei, translates as teacher, and “Song For Sensei,” was composed by Williams as a tribute to a mentor. It displays Ohno playing in a mainstream bop mode, and why he is one of the premier trumpeters in jazz today. “Musashi,” is a spoken word homage to a revered samurai, accented with a rhythmic tabla cadence by Ray Speigel. The percussive elements of the taiko (drumming) are featured on the traditional “Tairo Bushi,” where modern meets ancient in a musical rendition of courage. There is an energetic determination on “First Step,” highlighted by guitarist Paul Bollenbeck, and pianistClifford Carter, doing soloing honors at lightning speed. Ohno’s daughter Sasha is the featured cellist on “ReNew Reprise,” a pensive number revolving upon the theme of renewal and hopefulness, in all aspects of life. With an impressive discography of sixteen records as leader, extensive credentials of tenures with such luminaries as Art Blakey, Gil Evans, and Machito, and overcoming serious injuries and health issues, Shunzo Ohno certainly qualifies as a present day samurai. He embodies the Bushido Code, and his music is a reflection of this, he plays jazz as a way of life, with all its challenges and triumphs, he is never defeated. Track Listing: Easy Does It; renew; Song For Sensei; Musahi; Alone, Not Alone; Tairyo Bushi; Lea’s Run; First Step; ReNew Reprise. Personnel: Shunzo Ohno: trumpet; Buster Williams: bass; Cyro Babtista: percussion; Billy Drummond: drums; Jerome Jennings: drums; Paul Bollenback: guitar; Ed Howard: bass; Clifford carter: keyboards; Ray Spiegel: tablas; George Yamazawa: spoken word; Sasha Ono: cello; Ira Coleman: bass (7).